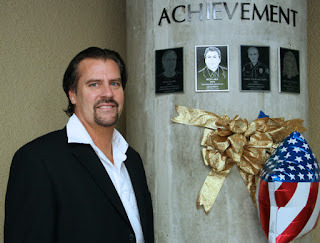 Kevin Daniel Elster was born August 3, 1964 in San Pedro California. The six foot two, sleek infielder was signed out of Golden West College in Huntington Beach California. 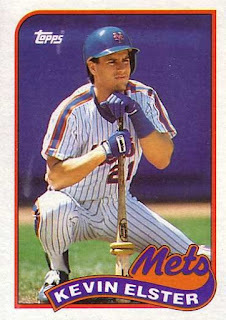 He was the Mets second round draft pick in 1984. Within two years he was at AA Jackson batting .269 & playing a solid shortstop. 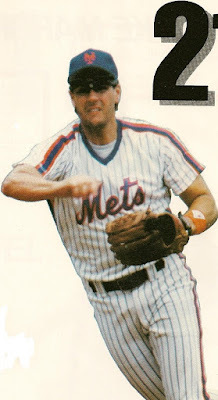 He earned a September call up in the 1986 Championship season making his debut on September 2nd, as a defensive replacement against the San Francisco Giants at Shea Stadium. He saw action in 19 games that month, batting .167 (5-30). Considered such a fine defensive shortstop early on in his career, he also made the post season roster. 1986 Post Season: He got into four games of the NLCS against the Houston Astros, going 0-4, but was on the field when the Mets clinched the pennant in Game Six at Houston. In the World Series he saw action against the Boston Red Sox playing three innings at shortstop in the classic Game #6 at Shea Stadium. He certainly celebrated with the club on the field, and was one of the last to leave, as he is visible in many of the celebration photographs. In 1987 he was at AAA Tidewater batting .310 with 8 HRs 74 RBIs & 83 runs scored, getting another September call up. 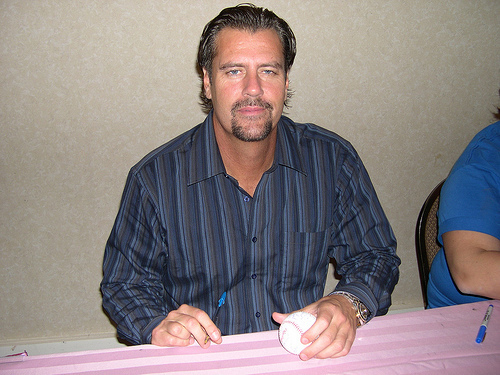 Elster appeared in five games of the 1987 season. 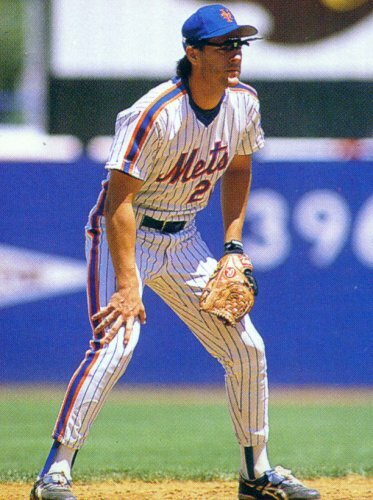 By 1988 he was penciled in as the Mets main shortstop, replacing the departed Rafael Santana. 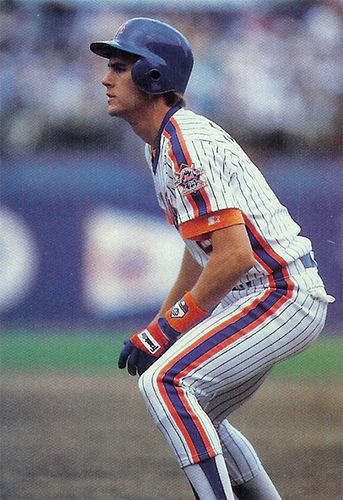 On Opening Day in Montreal, he hit a two run HR helping the Mets to a 10-6 win over the Expos. On April 17th he singled home the winning run in the bottom of the 9th inning in a 3-2 win over the St. Louis Cardinals. On May 31st Elster added another game winning hit, this time a walk off HR off Alejandro Pena to beat the Los Angeles Dodgers. On July 29th he hit a HR in the bottom of the 8th inning, to help Bobby Ojeda beat Pittsburgh's John Smiley 1-0 in a classic pitcher's duel. The next day he drove in two runs helping Sid Fernandez & Randy Meyers shut out the Pirates again at Shea Stadium 3-0. Later on in September he had a big day hitting two HRs & driving in three runs in the Mets 8-0 win over the Dodgers at Shea Stadium. On the season he hit .214 with 9 HRs 11 doubles & 37 RBIs. At short stop he posted a .977 fielding percentage (3rd best in the NL) turning 61 double plays while playing in 148 games (5th most in the NL). He was known for having a good glove & overall playing steady defensive. 1988 Post Season: He played in five games in the 1988 NLCS against the Los Angeles Dodgers, hitting .250 (going 2-8). In Game #6 at Dodger Stadium he went 1-3 with two walks, driving in a run with a double off Tim Leary in the 3rd inning. 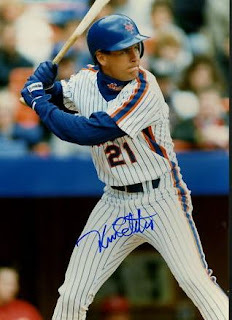 Record Breaker: During the 1988 season he began a streak of 88 consecutive games at short stop without making an error. At the time he set a new MLB record , breaking the former streak held by old time New York Giant Buddy Kerr. Kerr was working in the Mets organization as a scout at the time. Baltimore Orioles Hall of Famer Cal Ripken Jr. would later break that record, playing in his 95th errorless game in 1990. 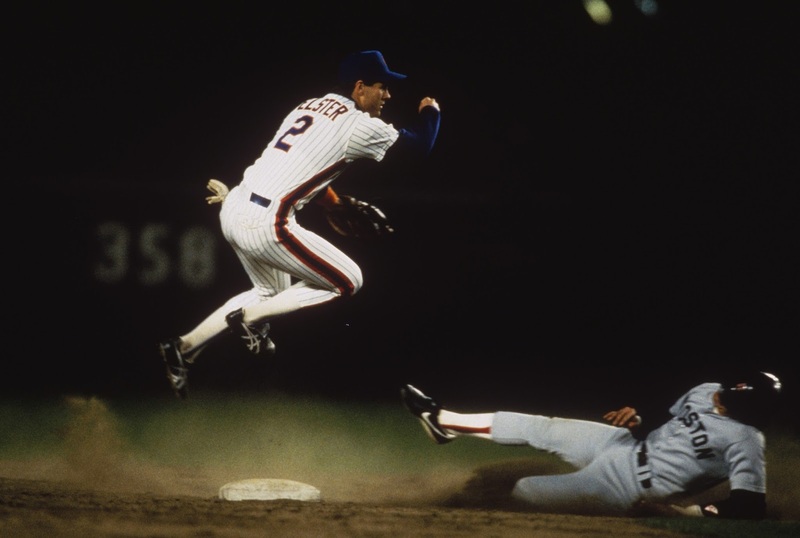 In 1989 Elster played in 150 games leading all NL shortstops in put outs & posted the league’s third best fielding percentage (.976) while turning 63 double plays. That season he put up some of his best numbers during his Mets career, he had 106 hits, with 10 HRs, 25 doubles & 55 RBIs although he only batted .231. He started out the year with a six game hit streak, hitting doubles in four straight games. He also had RBIs in four of the first six games of the year. At the end of July he had a twelve game hit streak & drove in ten runs in a nine game stretch. The next week Elster hit HRs in back to back games & then drove in the winning run the following day with an 8th inning single off Montreal's Tim Burke. In September he helped the team compete for the NL East title, with three HRs & 11 RBIs although they fell short, losing out to the Chicago Cubs. He struggled mightily in 1990, then the fans & the press got on him. His manager, Bud Harrelson tried to stand up for him, claiming he was driving in runs even with his low batting average. He barley hit above .100 the first month & didn't get over the .200 mark until late June. That month in Harrelson's defense, Elster did drive in 16 runs. His season was cut short on August 3rd went a shoulder injury finished off his year. He hit only .207 with a .274 on base %, 9 HRs 20 doubles & 45 RBIs in 92 games. In 1991 it seemed he may have lost his starting status as Bud Harrelson juggled the struggling players around. Elster still ended up playing 107 games at short. He batted .241 with 6 HRs 16 doubles & 36 RBIs. Defensively he was still among the top five defensive shortstops in the NL turning 39 double plays with a .970 fielding % (5th in the NL). The following season Elster felt pain when he threw to first base, he ended up needing shoulder surgery which put him out the rest of the season. He only appeared in just nine games that year and the Mets let him go to free agency after the season. He didn’t play at all in 1993, as he recovered from the surgery. He then had brief stints with the A.L.New York club, at the end of 1994 & start of 1995. Elster did not enjoy playing for the A.L. New York club & was upset at leaving the Mets. Although he did enjoy playing for his manager there; Buck Showalter. " I loved playing for Buck. He was a disciplinarian, and that worked for him. Buck was the only manager I had who called in the off-season, just to touch base and see how everything was going. That was pretty cool ". In 1994 he appeared in the movie Little Big League making his Hollywood debut. He was then sent to the Philadelphia Phillies batting .208 in 26 games the rest of the way. In 1996 Elster had an amazing resurgence, having his best season. That year he signed on with the Texas Rangers and won the A.L. Comeback Player of the Year Award. It was an exciting year for Texas as well, as they won their first Divisional title, under manager Johnny Oates. He had 24 HRs with 32 doubles 99 RBIs & a .252 average. He hit eleven sac flies which was third most in the AL. He set an MLB record by driving in 92 of his RBIs batting in the 9th position. At short stop he led the league in put outs (285) & his .981 fielding % was second best in the league. 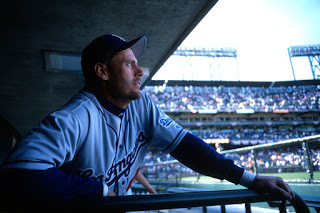 Out of the blue he then got a call from his old Mets skipper; Davey Johnson who said he needed a short stop while managing in L.A. Elster then finished his career with the Los Angeles Dodgers in 2000. On the Opening Day of the San Francisco Giants new Stadium, Pac Bell Park, he fueled the Giants /Dodger rivalry by hitting three HRs in the game. At the end of April he had already hit six HRs & finished the year with 14 total HRs while playing in just 80 games. In his 13 season career Elster is lifetime a .228 hitter with 648 hits 88 HRs 136 doubles 12 triples a .228 on base % & 376 RBIs. Defensively he posted a .974 fielding percentage, making only 98 errors in 7223 innings while turning 433 double plays. Personally Elster has been married & divorced twice. Honors: Elster has been named one of the top 50 Mets of All Time. He was also honored at Golden West College in Huntington Beach California at their Pillar of Achievement. Elster was not on hand for the 30th Anniversary of the 1986 Mets Championship team.